How to manage typed links? In our last post we talked about product structure made of assemblies and parts. This structure shows the physical links between parts. But what if you want to highlight other links? In special cases, you may want to show a part electrical relationship to another, for example. Linking parts with an electric point of view will result to a complete new data structure, that looks similar to a fault tree analysis and will help you detect power cuts. As we can see, that structure does not explain the electric links between parts. 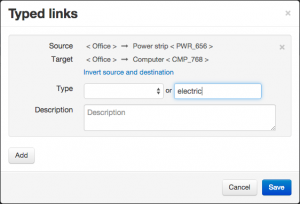 To define an electric link between 2 parts, select those parts in the tree and press the “Typed links” button. Then simply add a new typed link and enter type’s name and description. The source part is the first part you checked in the product structure. The target part is the other one. If needed, you can invert the 2 parts. Each typed link created with the “electric” type belongs then to a complete new tree. 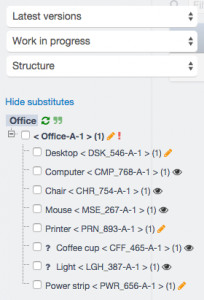 Choose this type on the above menu to display to new defined product connections. 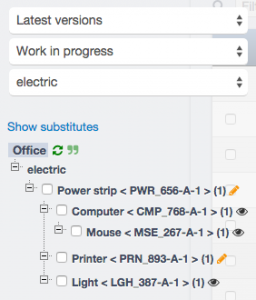 This new typed tree shows the electrical links between parts and makes it easier to fix bugs. Feel free to add as many typed links as you want between 2 parts (any energy link, any dependency link…). However it is impossible to create a loop (cyclic link) with the same type of link. In that case, the system will detect the cyclic link creation and reject it automatically in order to avoid infinite loop.